I frequently offer Mass here at Mount Saint Mary’s, but this is the first time for me to offer a Sunday evening Mass for you, the university students. I’m grateful to Father Brian Nolan for inviting me, happy to greet the Focus Missionaries who are with us tonight and most of all, I’m glad to be with Mount community for a regular Sunday Mass. We gather this evening in the final month of the Jubilee Year of Mercy. As you remember, Pope Francis invited us during the past year to unite as a Church to do several important things: to remember with gratitude just how merciful God is; finding God’s mercy in the person of Christ; to accept God’s mercy as we listen to God’s Word and share in the sacraments; to extend the mercy we have received by reconciling with others and by showing compassion for those who are in need. So next month, the Year of Mercy comes to a close at St. Peter’s in Rome. This does not mean, of course, that the Year of Mercy will be replaced by the “year of severity” or the “year of being upset about many things”. God is always merciful and mercy is the foundation of the Church’s life. What Pope Francis tried to do during the past year is help us focus on God’s mercy so that his love and kindness towards us would always be a part of our lives, no matter problems or challenges or sorrows we may face in the future. Pope Francis is also encouraging us, in spite of our own needs and problems, always to be compassionate toward others, especially the most vulnerable. So let us make the best of the Year of Mercy while we can so that, in the pope’s own words, we will be merciful like God the Father, and we will see in Jesus, the face of the father’s mercy. Today’s Scripture readings help us do just what the pope is asking, so stay tuned as I give you the Cliffs Notes on what our readings say to us about mercy. Thankfully, Jesus does give us a long essay on God’s mercy; you probably have enough of those in your life already. What he does do is to tell us a story about two very different people, one who was not open to God’s mercy and another who was. It’s not hard to guess who is who in this story but it’s worth looking at ourselves in light of these two characters. Which one of them are we like? Well, it’s pretty clear we wouldn’t want to be like the Pharisee. In my day, we would have called him a “stuffed shirt”.He was pompous and arrogant, even when talking to God. Not only did he regale God with all the good things he did, he also informed God that he was better than rest of humanity, including the tax collector sitting in the back of the temple area. It could be, but not so fast, if I may say so. Being smug and self-righteous is an equal-opportunity vice. People who are anti-religious and politically correct can also be smug, self-righteous and convinced of their moral superiority. In other words, it’s a lot easier for us to be like the Pharisee than we may think. But there are a couple of problems in being like the Pharisee. To begin with, if the Pharisee thought he was better than everyone else, imagine how he treated other people, whom he regarded as inferiors. He probably treated them harshly. He was unforgiving. He was insufferable. But that’s just for starters. The real problem with the Pharisee is that he sealed himself off from God’s mercy. If we go in and tell God we’re perfect, what is he supposed to do? God will try to change our minds but won’t enter our hearts unless we invite him. So now to the back of the temple, where we see the tax collector. Of course, the older I get the less I like tax collectors but Jesus seemed to like them a lot, so I guess we should take another look. To tell the truth, the tax collector wasn’t a very nice person. He cheated people, extorted money from them and lived in luxury. He was something like Zacchaeus, another tax collector in the Gospels, a short man who climbed up a tree so he could see Jesus. Looking at Jesus he had a conversion – he came down from the tree, invited Jesus to dinner and turned his whole life around. If the Pharisee didn’t give God an opening into his heart, this tax collector opened up high speed internet service for the Lord. Presumably, after praying as he did, the tax collector left the temple area and restored the money he had stolen and gave generously to the poor. Otherwise, he would not have been justified. Truth is, we are a lot like the tax collector. Suffice it to say that we may not cheat or steal but we do a lot of other stuff. So the more serious objection is that we don’t want to grovel for God’s mercy. For example, you might not want to confess your sins to a priest. Or, you might not like religion because it stirs up feelings of guilt. But that’s a little like saying I don’t like to go to the doctor because it reminds me that I don’t feel good and my doctor wants to know why. Guilt, like pain, reminds us that, deep down, something is seriously out of whack. When we open our hearts to God’s mercy, as did the tax collector, God doesn’t drill down on what’s out of whack; no, he is anxious to free us from whatever it is, so long as we acknowledge it. People who seek and find God’s mercy are not unhappy killjoys…quite the opposite. Forgiving and being forgiven bring us joy and true freedom. Failing to forgive and not allowing ourselves to be forgiven make us miserable. So, we owe the pope a lot for reminding us about God’s mercy and we owe it to ourselves to tap into God’s mercy, not just today or tomorrow but for the rest of our lives. God bless you and keep you always in his love. 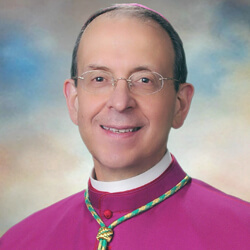 Read more from Archbishop Lori here.